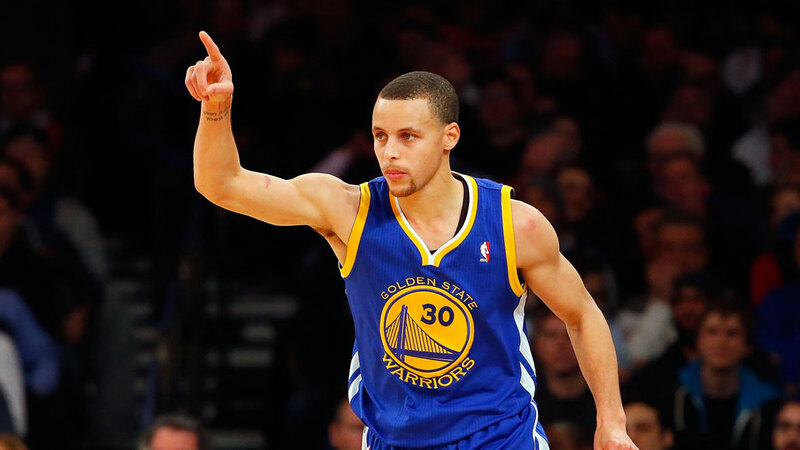 The NBA announced today Golden State Warriors point guard Stephen Curry won the 2015 Most Valuable Player Award. Curry easily beat out players like James Harden, LeBron James, Russell Westbrook and Anthony Davis for the award as you can see below. Curry was a deserving recipient of the award in my mind, and was on the fast track to get it for most of the season. Harden was right behind him, and a deserving second, but was always behind Curry. According to Tom Haberstroh on Twitter, this was the fifth-closest MVP vote in the past DECADE meaning it wasn’t very close at all. Crazy good company. The problem with the MVP Award in the NBA is that it rarely goes to the most valuable player. The award should really be called something else because it goes to the best player that season. If it was actually given to the most valuable player to their team players like Michael Jordan and LeBron James would win it every year in their primes. It is also really difficult to find a way to measure one player’s “value” to their team. Bill Simmons came up with four fool proof questions to try to help people determine which player has truly the most value. People could definitely make the case James Harden was the most valuable to his team because of the lack of surrounding cast around him. Harden played out of his mind this season and carried a Rockets team for stretches when they were without their second best player in Dwight Howard. 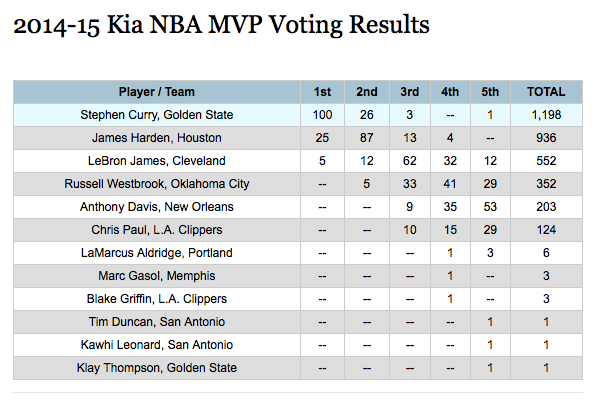 As I have said many times Curry and Harden would go 1-2 in the voting without question. LeBron took two months off and as I said the award goes to best player for this season and not always the most valuable. Stephen Curry is set up to win many more of these awards no matter who else is in the league. Playing on the best team in the league helps that, but that shouldn’t take anything away from the historic season Curry has had. This entry was posted in Home, NBA, Playoffs / The Finals and tagged 2015 NBA MVP, 2015 season, Anthony Davis, Best player, Bill Simmons, Curry, Golden State Warriors, James Harden, LeBron James, Most Valuable Player, MVP, NBA, NBA MVP, NBA Playoffs, Russell Westbrook, Stephen Curry, Tom Haberstroh, ZML. Bookmark the permalink. ← May 2, 2015: Were you Not Entertained? !